< Add spices: four tablespoons ("two handfuls") crumbled sage,salt, pepper, ground nutmeg. The recipe does not mention modern day ingredients for bratwurst, which include ground mace and ground ginger; these can be included for extra flavor. > Add spices: four tablespoons ("two handfuls<nowiki>")</nowiki> crumbled sage,salt, pepper, ground nutmeg. The recipe does not mention modern day ingredients for bratwurst, which include ground mace and ground ginger; these can be included for extra flavor. "To make the best Sausages that ever was eat." This attempt at making a genuine recipe from the European Middle Ages turned out to be something we still make and eat all the time today. A number of medieval cookbooks have been scanned and put online, and some of the recipes from those cookbooks have shown up on several Web sites. One of those recipes that caught my eye had a promising title: To make the best sausages that ever was eat. It had a small list of ingredients, and it seemed easy to make. Upon researching the ingredients, I discovered that this is, in fact, a recipe for making bratwurst sausage. And except for stuffing the sausage casings, it was indeed easy to make, and also quite delicious. 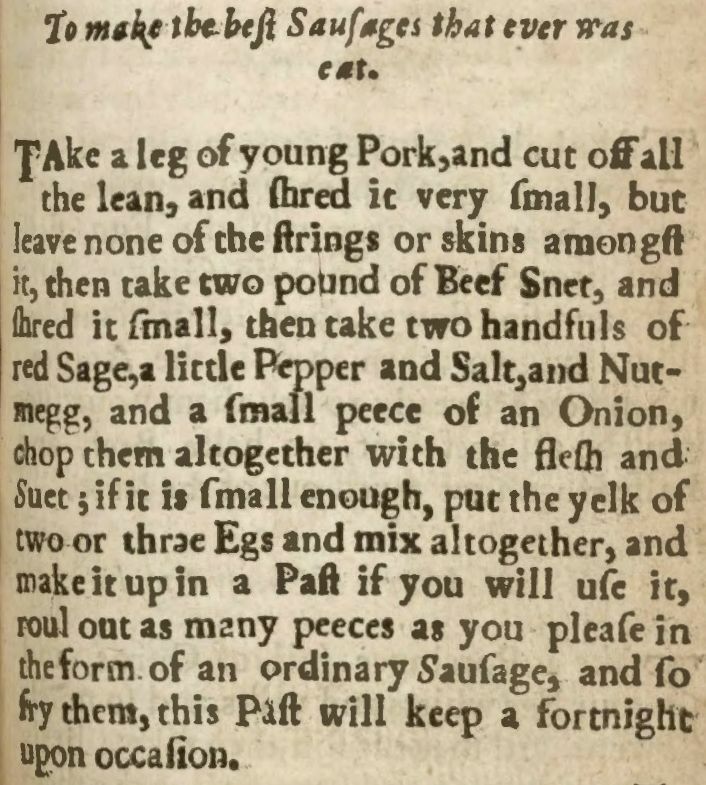 "Take a leg of young Pork, and cut off all the lean, and shred it very small, but leave none of the strings or skins amongst it, then take two pound of Beef Suet, and shred it small, then take two handfuls of red Sage, a little Pepper and Salt, and Nutmegg, and a small peece of an Onion, chop them altogether with the flesh and Suet; if it is small enough, put the yolk of two or thrae Egs and mix altogether, and make it up in a Past [paste] if you will use it, roul out as many peeces as you please in the form of an ordinary Sausage, and so fry them, this Past will keep a fortnight upon occasion." Pans needed: Meat grinder to "shred it very small, but leave none of the strings or skins amonst it." Large mixing bowl. And a cast iron skillet for frying the finished sausage. Remove skin, bone and extra fat from pork shoulder, and grind it in a meat grinder. (Alternately, you can purchase ground pork at the store.) Grind up two pounds of suet. Mix both of these together in a large bowl. Chop and mince onion and mix it in. Add spices: four tablespoons ("two handfuls") crumbled sage,salt, pepper, ground nutmeg. The recipe does not mention modern day ingredients for bratwurst, which include ground mace and ground ginger; these can be included for extra flavor. Separate three eggs, add the yolks. The egg whites can be used in a separate dish or discarded, as they are not used here. Mix it all together into a simple sausage. This can be shaped into patties or rolls, and fried.